Zoe Hickel had two goals as the Calgary Inferno defeated Les Canadiennes de Montreal 5-2 on Sunday at Coca-Cola Coliseum for their second Clarkson Cup title in franchise history. The Calgary Inferno earned a measure of revenge Sunday in the latest chapter of their rivalry with Les Canadiennes de Montreal. 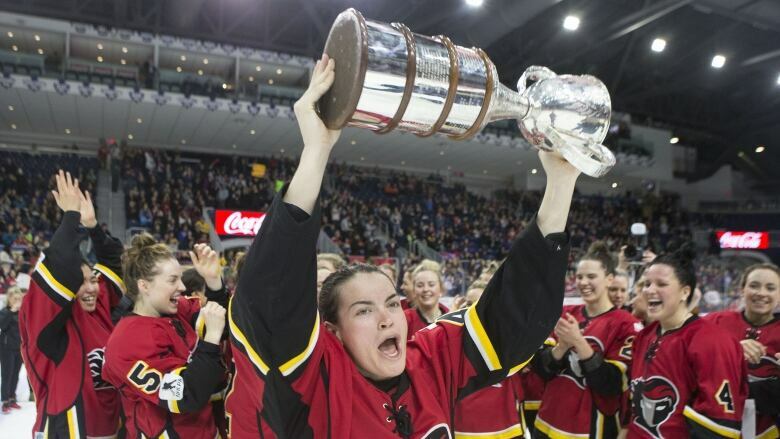 Zoe Hickel had two goals as the Inferno defeated Les Canadiennes 5-2 to win the Clarkson Cup at Coca-Cola Coliseum. It was the third time in four years that the teams had faced off in the Canadian Women's Hockey League final. Calgary won in 2016 but Montreal rebounded a year later. "I've been on other end of this," said Inferno forward Brianne Jenner. "This is my third time playing in the Clarkson Cup, third time against Montreal, so there's definitely a rivalry there. In a couple of days a few of them will be teammates at [the 2019 worlds in Finland] and it'll all be smiles, but it feels pretty good Calgary got this one." Brianna Decker, Halli Krzyzaniak and Rebecca Johnston, into an empty net, also scored for Calgary. Decker was named most valuable player of the game. "I thrive off that pressure, I thrive off these games," said the 27-year-old, who won gold with the U.S. at the 2018 Olympics in Pyeongchang. "It's fun to be out there and compete in the top championship games every season." Ann-Sophie Bettez had both goals for Les Canadiennes. Marie-Philip Poulin, fresh off capturing her third CWHL MVP award in four years, did not see the ice after taking the ceremonial puck drop prior to the game. Les Canadiennes coach Caroline Ouellette said the team "couldn't compromise her career for that one moment," but she is hopeful to be ready for the world championship next month. "She was heartbroken," said Ouellette. "She's the type of player that craves those big moments. Those moments where everything is on the line. She's our captain, she's our leader, she's the best player in the league in my opinion." Calgary got off to a fast start as the Inferno's Johnston wheeled around the Montreal zone and fired a shot off the far post just a few minutes into the first period. Several minutes later, Jenner slipped into the Montreal zone and put on a great display of puck skills after falling to her knees. The Inferno maintained possession and worked the puck around to Krzyzaniak, who scored on a shot from the point to put Calgary ahead 2-0 at 12:59. Hickel said the Inferno's first-period performance provided a massive boost to the team. "It's huge for the confidence for us," she said. "And just for the team as a whole. We had great energy as a team on the bench."